Another MEGA Bloks set review, but this time not one drawn from the future world of the Halo series. Also part of their Collector Series of sets is the Call of Duty line, and so we decided to jump in whole hog and test one of them out. To that end we popped on a space suit and prepared for some Zero-G as we built the ODIN Space Station Strike. Weird looking, innit? 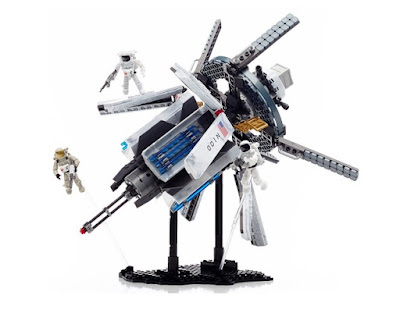 The MEGA Bloks Call of Duty ODIN Space Station Strike set contains 695 parts and three micro action figures, combining to create this authentic (if slightly Sci-Fi) looking satellite which appears in-game. All told, it took us about three hours to complete, so lets have a look at what we managed. This multi-faceted build was, for the most part, a real eye-opener to put together. When constructing the central 'core' of the station you can't really tell which bit is which until the outer layers go on. We think it looks pretty amazing and could even be mistaken for a model of a real-life NASA satellite. Even once you remove the posed figures from the equation, there is still a tonne of stuff going on with this set; designed to look as if the ODIN (Orbital Defence Initiative) station is about to fire. As you can see the whole thing is held aloft and at an aggressive downward angle by the black base plate. At first we wondered why this wasn't transparent (like the two figure stands - more on those later) but now we realise it must be to represent the blackness of space. Makes sense. ...that can be removed to get access to the station's innards, as in the game. Those four 'pods' on the sides of the station can be closed up to conceal their blue transparent rods, with some great printed detail on the outside. We're very happy to report that there is not a single sticker used in this set and that the white parts seen above are of the gorgeous marble-effect plastic that we've come to love from MEGA Bloks. One slight downer was that the four pods are identical and used up probably more than half of the set's parts count, making that section of the build quite repetitive. Between the forward weapons section and the rear solar panel section (which can rotate freely, by the way) there is some great detail in these gold panels which can fold up into the body of the station. We would have liked to have them twice the length, but they go a long way to increasing the authenticity of the design. Onto the figures now, and for us, these guys were the main event. Using the same highly-articulated system that we've written about (and adored) from the Halo range of sets, the three included astronauts are amazing. They use the same base body as the Halo figures but have enough differences to really make them stand out. ... such as this. This Light Machine Gun can be modified and customised unlike any similar weapon in the Halo universe. As you can see the stock, barrel, clip, and silencer (surely not needed in space?) can all be taken off and swapped. Considering that the above gun is just a couple of centimetres in length is pretty remarkably - we mean, look at the level of detail! You can see here how well the light amount of paint on the figures has been used well in conjunction with the prints. Yes, those teeny tiny USA flags on the astro's suit are prints, and very finely detailed ones at that. As we mentioned earlier, included in the set are two transparent rods which can be slotted into the figures' backs and used to elevate them in floating-in-space positions around the ODIN. This looks great, and certainly you might find it hard to see the rod at all in the picture above. ...the figures actually looked just as real when gripping to the many hand-holds on the ODIN, intentionally dotted about the station. Thanks to the rigidity of the figures' design, they are able to keep themselves up and locked into a pose while being attached only by one hand. Good design work that, guys. 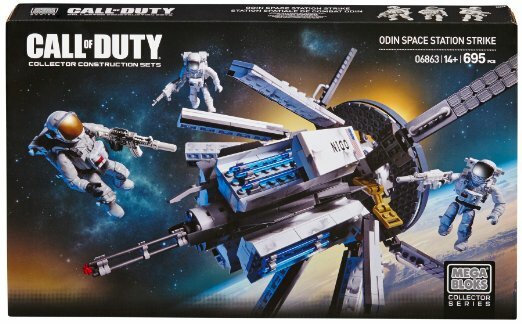 So the MEGA Bloks Call of Duty ODIN Space Station Strike set was a great introduction for us into the COD line; one we hope to revisit very soon. For fans of the game this a great model to have on your shelf, and for fans of building you'll love the fiddly and surprising construction. Go out and snag one today.